The SIP Protection Anti-Vibration Forestry Gloves have been designed to minimise vibrations and maximise protection when operating forestry machinery such as hedgecutters, brushcutters and strimmers. 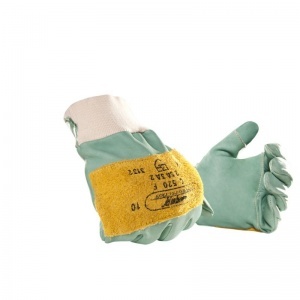 The SIP Protection Anti-Vibration Forestry Gloves are fully water and oil-repellent, while the palms of the gloves are lined with a high density foam which absorbs impacts and vibrations. 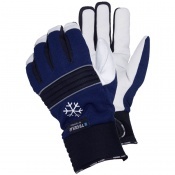 The gloves are made from durable hide leather with reinforced Kevlar stitching and also feature an elasticated wrist cuff with artery protection and extra leather padding on the top of both hands. 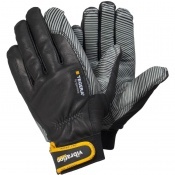 The SIP Protection Anti-Vibration Forestry Gloves feature a heavily padded palm which helps to nullify vibrations from machinery and also minimise the effect of impacts to the hands. The elasticated cuff on the gloves keeps the hands warm and dry but also features artery protection to help prevent a serious injury to the wrist when handling machinery. Furthermore, the gloves are 100% hide leather which varies in thickness between 2.0mm and 2.2mm across the glove with an extra layer of leather on top of the hand for added protection. 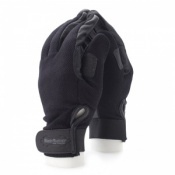 Kevlar stitching reinforces the seams of the gloves, with Kevlar's tensile strength more than twice that of nylon and polyester whilst offering less stretch. The Anti-Vibration Gloves score highly in the abrasion and tearing tests as this is the most common risk associated with forestry machinery such as hedgecutters.